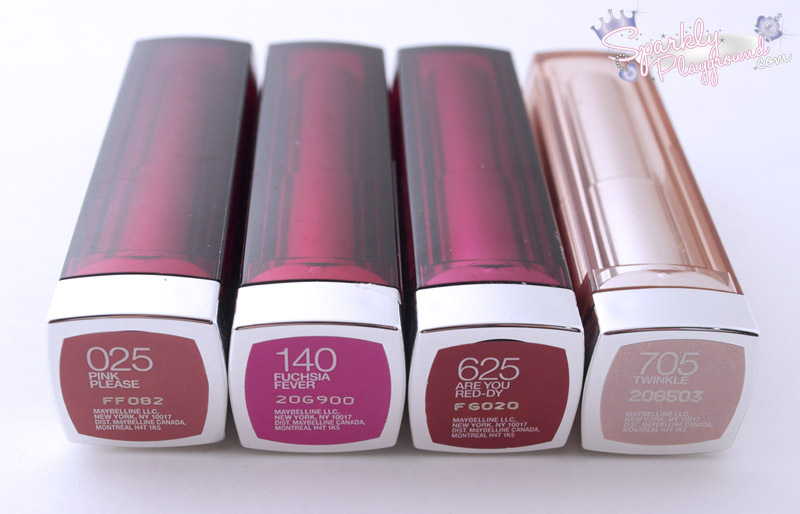 I got these lipsticks at the L'Oreal Warehouse Sale Spring/Summer 2011. So they were extremely discounted at $2.75 CDN. Suggested Retail price is $6-8 CDN and can be found in Walmart, Shoppers Drug Mart and more. It's really an obsession the fact that I still buy lipsticks but I do believe these are some of the most popular colours in the range. Let's first start with the packaging, it is extremely light and the cap colour varies depending on the colour range it belongs to (Pinks, Neutrals, Plums, Pearls, and Reds). I haven't used Maybelline lip products in a very long time so I wasn't sure what to expect. I'm going to review them by shade because I had different experiences with each. This is definitely the easiest colour to pull off for an everyday sweet look and my favourite colour in the bunch. Semi-Pigmented, not as pigmented compared to Fushia Fever. The smell was very synthetic and waxy and everything gross. 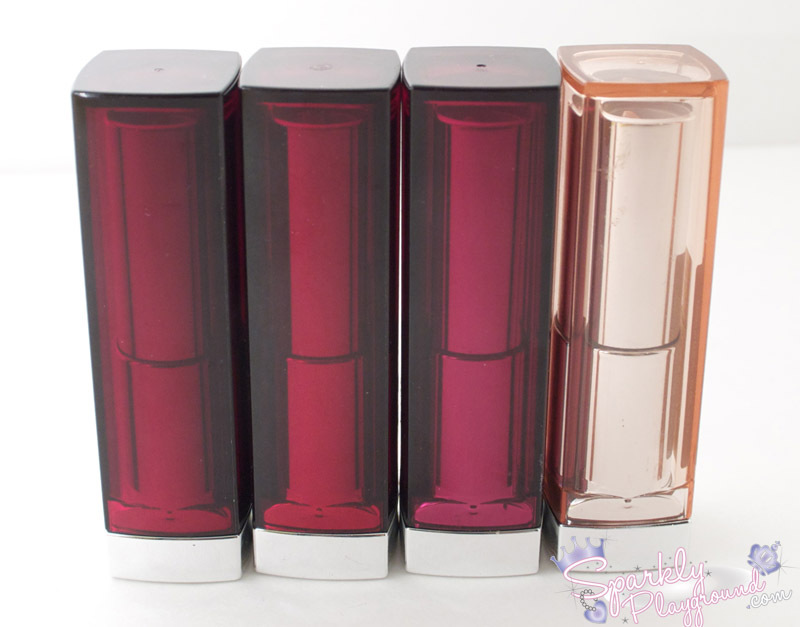 It reminds me of old lipstick (which in my case may be since it was from a warehouse sale. Usually I like to apply lip chap before applying lipstick but once that is done, the lipstick is almost impossible to glide out colour. It only glides on when my lips are bare and none slippery. Everything but colour has been disappointing. Trust me, I've had old lipsticks before, and it's not as dry/smelly as this one. Absolutely gorgeous colour, it reminds me of Barbie actually. 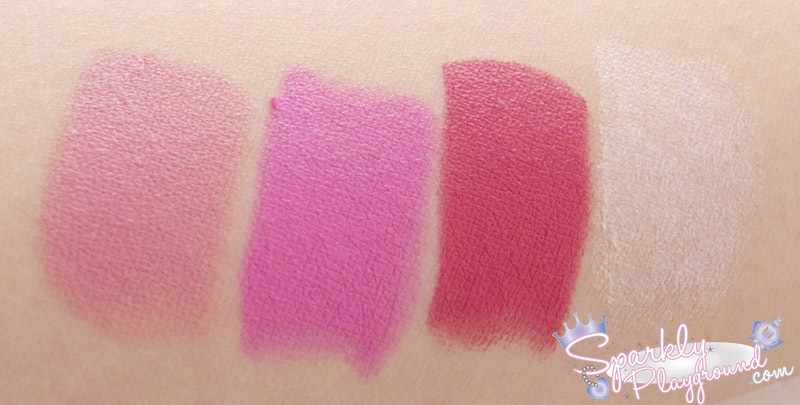 From MUA reviews, people commented that it is a close dupe to the MAC Candy Yum Yum. Glides on smoothly and very pigmented, extremely close to the number sticker. It doesn't have the yucky smell like Pink Please - just a tint of honey (maybe because of the honey nectar?) and vanilla. Creamy but does not bleed into the fine lines of my lips. Leaves a soft stain and lasting power is about 3-4 hours. 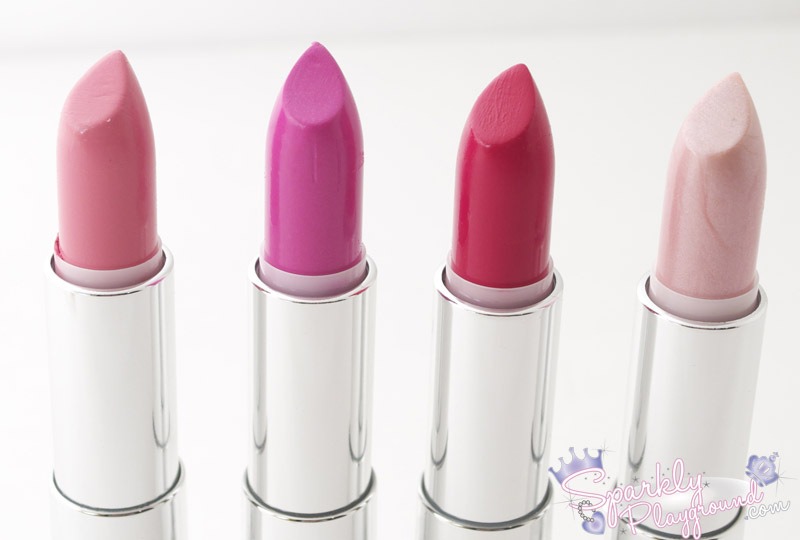 This lipsticks’ quality is very similar to Fushia Fever except for the colour only. The colour is a very red, red fushia in my opinion. It doesn’t have enough blue hue to make it a true blood red. The comes close to MAC Viva Glam Cyndi. It also has a creamy sheen finish, not matte or glossy. The colour payout is excellent and glides on smoothly. Stays on for about 3-4 hours and stains a little. Glad that it doesn’t bleed like crazy, not unless you apply too much. Love it! Initially I envisioned a cute and sweet innocent look from this lip colour, I mean, the swatch looks great when I was buying this. Then when I got home, put it on my lips… what was I thinking?!?! This lip colour brought out my skin’s yellow undertone and made me look sick. It also reminded me of the Spice Girls days when I attemped the Baby Spice look and it just won’t work. In terms of quality, it was very easy to guide the colour out but it is a very very sheer colour. It is more frosty than pearl and if you would like a pigmented colour, you will need to build it a lot. After an hour or so, it dries up and my lips becomes chappy. Of course the smell is also synthetic and yucky. 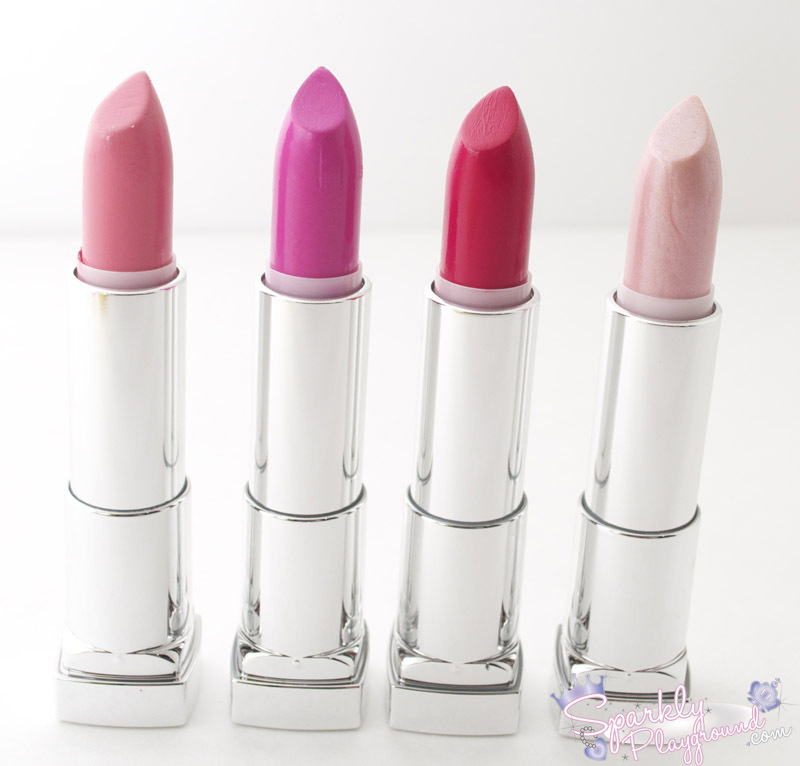 Now, I only use this colour to mix other colour creamy lipsticks to get a frosty finish. Product: 3/5 ♥ Quite creamy, great colour range and pigmented. Packaging: 4/5 ♥ I like the colour sticker and practical packaging. Good enough for the price you pay for. Price: 5/5 ♥ It's awesome when you find them for $2-4 bucks. Not a fan of paying anything more than $6 for this lipstick though. Comes in a good size as well.